We are very excited to be reviewing the new Shark APEX DuoClean Lift Away with Zero M as we’ve been using the previous Shark APEX in our cleaning schedule for a while and we are very interested to see what’s changed in the new version. The Shark APEX with Zero M is the most powerful upright vacuum cleaner in Shark’s lineup, and it’s probably the most powerful bagless vacuum on the market today. We measured its suction at an astonishing 101 inches of water lift, which is higher than we personally have ever seen. Its airflow is also extremely high at 90 CFM, which is higher than other premium vacuums, like the Dyson Ball Animal 2 or the Miele U1. It’s even higher than the previous APEX despite it having the same 1,350-watt motor. 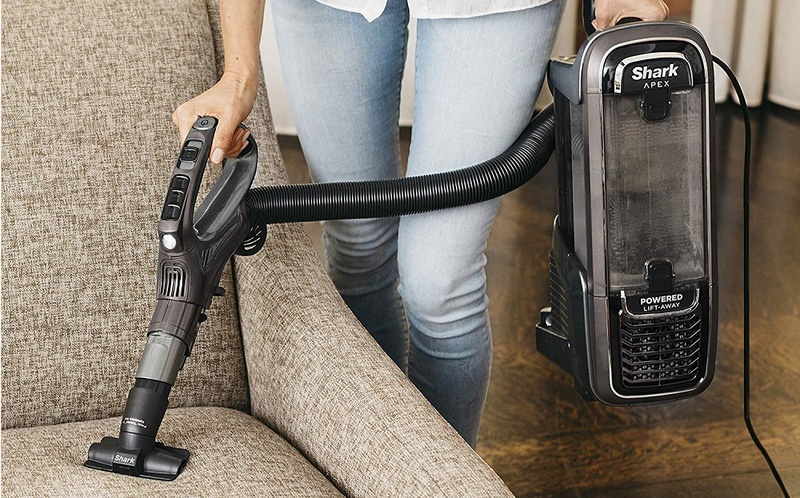 As Shark’s top-of-the-line upright vacuum, it’s packed with a ton of features including the DuoClean floor nozzle and the new Zero M technology, both of which we’ll talk more about later. It has bright LED lights on the floor nozzle and one on the handle. The Shark AZ1002 APEX has noise reduction technology as well as active glide technology, which makes it easier to maneuver. This unit is also a completely sealed system with HEPA filtration, which is, unfortunately, rarer than it probably should be as most vacuums out there leak badly even if they do have HEPA filters. It’s also a powered lift away, meaning that it has a variety of easy to access configurations. 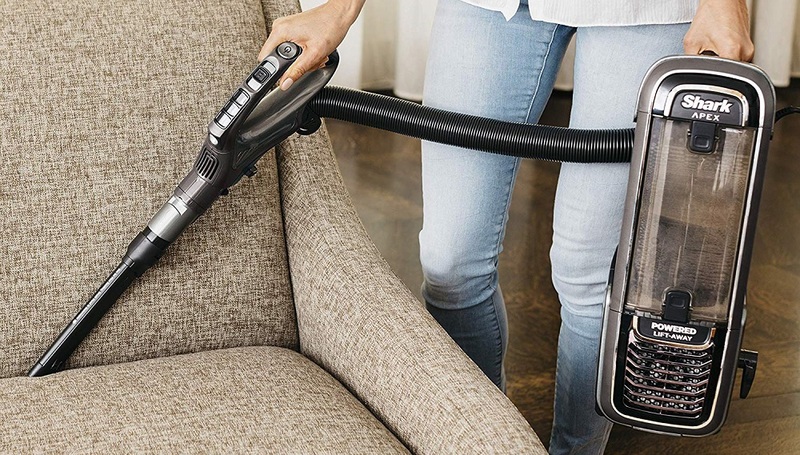 This includes the power lift away mode, which dramatically reduces the weight and makes it super easy to clean in hard-to-reach places, as the brush roll is still powered in this mode. Before we get to the new Zero M, let’s talk about DuoClean Technology. We think DuoClean Technology is the best invention in the vacuum world in a long time. It’s basically a soft roller and a standard brush roll combined in the same cleaner head. It picks up just about everything it touches on carpet or hard floors. When we prepare pickup tests, it’s the only type of vacuum that has never failed a pickup test no matter what we throw at it. It really is the top of the vacuum food chain as the name APEX suggests. But it’s not just about gobbling up big messes, the vacuum is also very precise. The soft roller is amazing for the finest dust, up to the largest debris on hard floors. If you have hard floors, you need a vacuum with a soft roller, period. But the APEX is great for carpets as well. 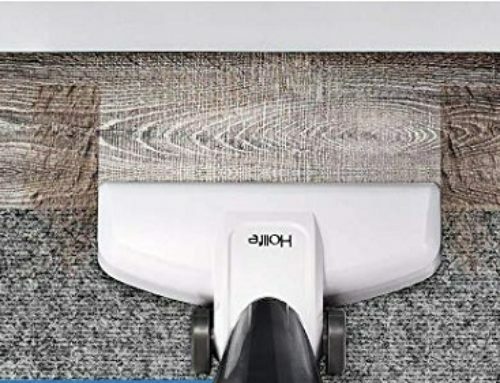 You just flip the switch from its hard floor to its low or high pile carpet setting, and it reduces the suction and speeds up the brush roll for the same great performance on the carpet. Its pet hair pickup is second to none as well, which brings us to the brand new Zero M technology. Zero M, which we assume stands for zero maintenance, is a completely redesigned brush roll which uses little protrusions on the top of the nozzle to actively remove pet hair that tries to wrap itself around the brush. We tried our very best to get it wrapped in hair with our tests, and at the end of the day, there was virtually nothing to clean up. So this seems to solve the age-old problem of vacuums requiring tedious and kind of nasty cleanings of the brush bar. So kudos to Shark for yet another innovative technology. Besides the mysterious increase in power from the previous version, there are a few other changes, including my favorite, which is an upgrade in the wheels. The previous generation used plastic wheels with a felt cover which was prone to wear and was the principal reason we never fully endorsed that version. But thankfully, the new Zero M version has upgraded the wheels to a super sturdy rubber which seems like they’ll last the lifetime of the upright vacuum. There’s also a slight change in the hose construction, and it seems that Shark is using this type of hose on all its new vacuums and it seems sturdy as well. The attachment set varies but ours came with a crevice tool, a combo upholstery tool dusting brush, an anti-allergen dusting brush, and a flexible under appliance wand. So let’s move on to the cons. It’s no surprise that Shark’s most powerful vacuum is also its heaviest vacuum at 16 pounds. But heavy for Shark is a relative idea. The APEX is basically the same weight as the Sebo Felix and lighter than all the others on this list. That being said, it’s still heavy, but since we almost exclusively use the vacuum in lift away mode, we hardly notice it. On that point, we should mention that while we like the lift away mode on hard floors, on carpet, it’s almost too light. The DuoClean roller tends to pull itself forward which takes more effort to pull it back. 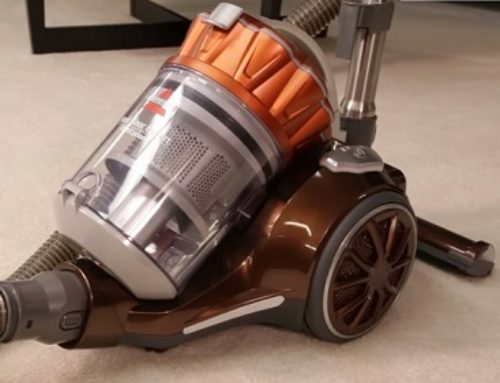 We don’t notice this on hard floors, but if we are vacuuming a house with mostly carpets, we prefer to use it in its standard mode because the weight of the vacuum cancels out the forward pulling motion. So we like the Shark APEX DuoClean, and it should count for something that, of all the vacuums we have, it’s the APEX we turn to when we have to clean the house. 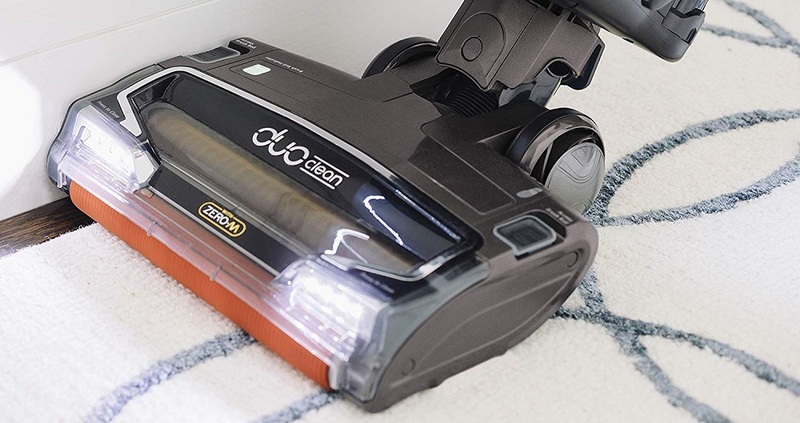 We like the DuoClean technology, and now, with the Zero M technology, which will reduce or possibly eliminate the cleaning of the brush rolls, the upgrade to the wheels, and the sealed system, we can say that the Shark APEX DuoClean Lift Away with Zero M is an excellent buy that you won’t regret. Best Stick Vacuums: Stick Vacuum Better than Upright? 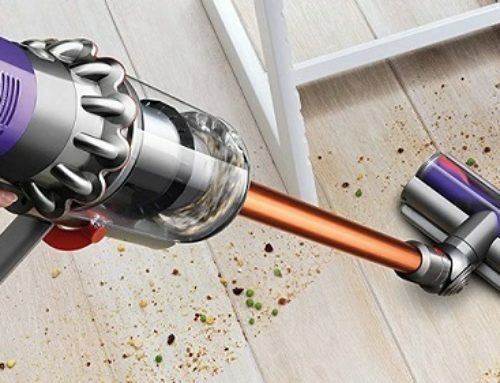 Are Canister Vacuums Worth It?